Combine efficient management with flexible IT building blocks of servers, storage and networking to optimize for both modern and legacy workloads. Bridge from a traditional data center to one that is software defined, and gain new efficiencies with the FX2 chassis that shares cooling, power, networking and PCI expansion slots with the various FX server and storage components that plug into the chassis. Combining these modular components of the FX architecture allows you to quickly deploy the exact combination of compute, storage and networking resources to best fulfill your business needs. The ability to quickly deploy and redirect your resources helps create a dynamic, workload-optimized converged infrastructure that redefines data center agility and enables you to stay ahead of your competition. Watch this video for an overview of the innovative FX converged architecture. Easily fit your infrastructure to your workloads with “bite-sized” modular blocks of computing and storage resources. Scale from single-socket microservers up to high-performance 4-socket servers and add massive DAS capacity within a single 2U rack chassis to tailor your data center with the precise computing power you need for the job. Implement an unprecedented level of IT infrastructure density to help lower overall costs and improve workload performance. The FX architecture enables you to use any style of storage to fit your needs — SAN, DAS or software defined — including in-chassis direct-attached FX storage blocks. With FX in place, you can scale workloads on demand and add resources incrementally — without the expense and inefficiency of overprovisioning — and be ready for modern workloads. A full portfolio of FX components — from microservers to 4-socket servers, plus a compact 16-drive direct-attached storage component — offers phenomenal infrastructure flexibility, including dense virtualization or scale-out Hadoop environments for Big Data analysis. Optional IO Aggregator modules can save time and costs by simplifying cabling complexity, enhancing “east/west” traffic flow within the chassis and enabling easy LAN/SAN convergence. 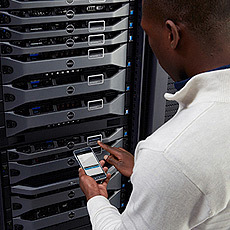 Streamline management of your converged infrastructure with Dell OpenManage. Simplify building and managing data centers by combining enterprise-level systems management and hypervisor integration with modular, converged infrastructure. Ensure management consistency and maintain the management style that suits your data center and staff — manage at the server, chassis or rack level. In addition, deploy and provision your servers faster and automate daily operations with agent-free lifecycle management through the integrated Dell Remote Access Controller (iDRAC) with Lifecycle Controller and the Dell Chassis Management Controller (CMC). 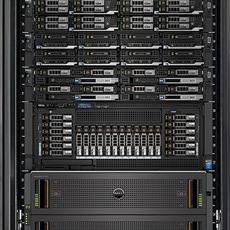 Talk to a Dell expert to learn more about the FX architecture.